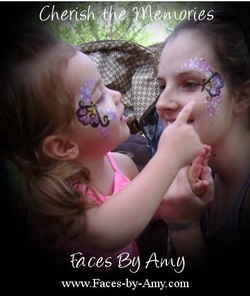 I offer face painting for children and adults in the Blackfoot and surrounding areas. I first got my start in face painting because of the Relay for Life in the Magic Valley. Since then I've done Wendell's Dairy Days, Mimi's Fall Festival, the Castleford Car Classic Jamboree, and the Thousand Springs Festival. I use Tag, Diamond FX, Wolfe face paint, and Paradise. The highest quality paints that come off easily with soap and water. They are FDA approved, hypoallergenic, and non toxic. Whoever you choose to face paint at your event PLEASE find someone who uses FDA approved paints that are safe for skin! Just because it says NON TOXIC does not mean it should be used on the skin. Acrylic paints should never, EVER be used on skin (even watered down) as it can cause permanent damage!